Amazing. Beautiful. Fantastic. Thrilling. Gorgeous. Brilliant. Honestly, I could go on and on with more words to describe this book but you get the idea right. This book passed the standards; it was miles better than Angel and gave us everything we wanted. A story filled with fiery passion, shocking twists, a love made in heaven and Angels. 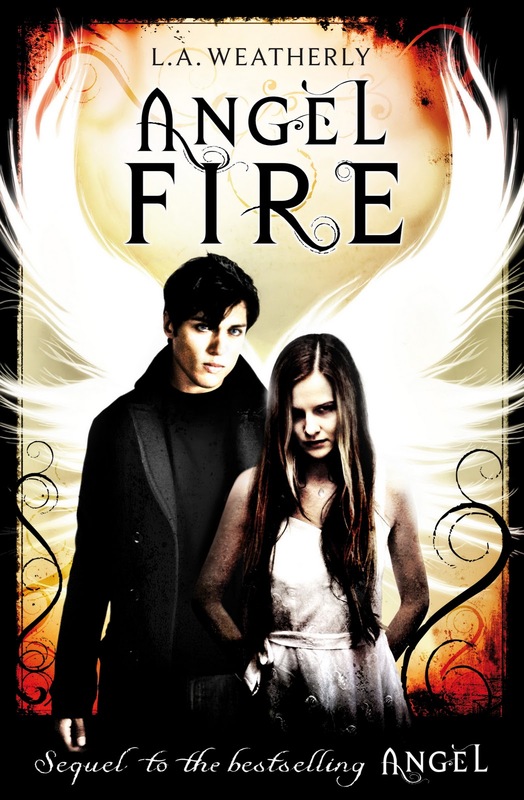 The first book was so frikkin amazing, entertaining, refreshing and unique, so I looked at this book and said, how on earth can you beat Angel, but clearly the answer is: ‘With FIRE’ because this book heated me up. It was definitely a Roller Coaster ride of a Thriller with a riddle-ingly unique plot and fantabulous sequel to its previous book. The plot actually follows both Willow and Alex and Seb (a new shocker for you to discover) switching between 1st person for willow and 3rd for Alex and Seb. There is another chance to destroy the angels and they seize it firmly but throughout their journey there is deceit, love feuds, battles and certain type of Rapture. The writing, as usual was firmly and most definitely stunning, with vivid description, so crisp and sharp in my mind, and emotions so strong and rich I felt them myself. L.A. Weatherly’s writing is most definitely unique and mixed with perfectly paced movement and the right amount of description entwined with a whimsical musical prose sprinkled with magic. It was most certainly wonderful to read and I could not, put it down, not once. It kept me up to all hours, engrossed, and now I think I may have Angel Burn. I just can’t get the book out of my head. The plot was bloody brilliant. I fused everything you could want. A burning desire, a triangle of love, a supernatural twist and a happy ending. You will not be able to put this book down. The plot was truly magical, though, so unique and special. Beautiful and sparkling yet it will keep your pulse pounding and you heart racing. Obviously a lot of thought has gone into the plot, and it has been constructed carefully and precisely so one chapter will leave you clueless and a few chapters later it will all slide together and you’ll be like ‘Ohhh! That’s clever’. I’m most definitely certain that the wonderful, amazing, fandabidosi plot/story accounts for the 709 pages of pure bliss, that burned their way into my mind. The characters in this are all so unique and special, and I don’t get the vibe that L.A. Weatherly is trying to make the characters to much of this or too much of that. The characters aren’t forced. They just are, and that’s what makes them so special. There is no perfect brooding boy with a secret or some incredibly ugly or clumsy girl. Everyone is the same, on one side or another, each side with the same goal. All of the characters extremely well built up. Those who are new, well you find out pretty much everything, and those you already know, you find out more, some things that you never even expected. They are all so different in their own unique way and I have come to care for them as my own friends in my mind, whilst reading the novel, feeling sad with them or feeling happy with them, or feeling petrified with them as they jump of a building hoping for something that sort of isn’t there to land them to safety. My favourite character is in fact a couple that didn’t really happen but I would love to see it happen in Angel Fever, but that couple is Willow and Seb. In book 1 Alex was the guy for Willow but then Seb came along and it just seems so right for the two of them. Like Alex is no longer meant to be. Also they seem better for each other as the book has taken on a new tone, which is more understanding and more mature. Almost as if the characters have grown up and moved on from the stages of first love, and are now in a serious relationship. Overall the book cannot be summed up into any phrase, word or even amount of words because the novel is too fantastic to fully understand until you have read it but I will end this review with two words: Truly Wonderful.